December 13, 2016 5:00 pm / 22 Comments on Sticker shock. With the year coming to a close, I kept the promise I made to myself and did not purchase any new woodworking tools this past year. For the record, I have no problem with purchasing new tools, old tools, or any tools. As I’ve said many times before, whether you prefer working with five tools or fifty, that is nobody’s business but your own. In any event, I do have a bit of guilt free woodworking money, though I didn’t really plan on spending it for a bit. Though last night I did try and was quite shocked at what I found. To begin at the beginning, my Father-in-Law has some land in upstate Pennsylvania, and on that land is a lot of trees. From time to time those trees need to be felled, so I asked him if he wouldn’t mind bringing me home some hickory and ash the next time they happened to take them down. A few weeks back when my Father-in-Law visited he dropped off two large pieces (logs) of Hickory and a smaller (but still nice sized) ash log. I promptly split the ash log with my somewhat sharp axe (more on that in another post) and sawed in half one of the hickory logs. Because I only have limited experience in working with wood “from the log”, I was at a bit of a loss as far as how to further proceed. Ideally, I would use a band saw to cut the logs to rough size, use a jack plane to get the boards somewhat true, then run the boards through a surface planer to get close to final dimension. Since I don’t own a bandsaw, that plan is out the window. I could go the really old school route and rough shape the boards with a hatchet, however, this past summer I dealt with tendonitis in my right arm, and it was not fun. Tendonitis cannot be cured with exercise, though stretching seems to help, and after splitting some boards with an axe for 30 minutes I fully realized that axe work is not a long-term solution for me. After doing some research, it seems that one agreed upon method is using a bow saw to kerf the wood to rough size, chop out the waste, and using a scrub plane to hog the board down to rough dimension. Why a scrub plane and not a jack plane? Apparently the “experts” say that the physical size and weight of the jack plane is not conducive to this type of work, and it will simply take too long and be too tiring to perform any meaningful work. So I turned to the idea of purchasing a scrub plane. For those who may be unaware, a scrub plane is simply a small bench plane containing a thick iron with a heavy radius to quickly hog off material from rough sawn boards. When I first began woodworking, these planes could be found in good condition on Ebay usually for around $50, the Stanley 40 ½ being one of the more common versions. Since I hadn’t, at the time, ever planned on preparing lumber straight from the log, or rough dimensioning all of my lumber in general, a scrub plane was near the bottom on my list of necessary woodworking tools. It had never even occurred to me to buy one until now. So last night when I was doing some scrub plane research my jaw dropped at the costs. A new scrub from Lie Nielsen or Veritas costs in the $150 range, which is what I expected. A traditional, wood-bodied scrub from ECE costs between $90-$100 depending on the source. Though I like the look of the ECE plane, and it is relatively inexpensive, they only offer it with a Chrome Vanadium iron. I am no expert on tool steel, but I know that I prefer high carbon steel to the stuff similar to A2. The high carbon steel sharpens easier, and that is all that matters to me. Anyway, before going the “new” route, I decided to give Ebay a try, and boy was I surprised at what I found. Most of the scrub planes on Ebay (and there was not a large variety to choose from) ranged in cost from $100-$125, not including shipping. Every one of those planes was in need of restoration. The planes in better condition were at least the cost of a new tool, and in most cases much more. I did a bit more research and found that scrub planes have apparently become a hot commodity among tool collectors, though I’m not sure as to why. So this now leaves me in a bit of a dilemma. Those of you who have read this blog in the past will know that I have nothing against tool restoration; I am in fact in the middle of restoring several tools at this very moment. Nonetheless, I feel that $100 plus is far too much money for a vintage tool that needs work in order to become usable, in particular when I can get a newer and better version for just a little more in cost. While I generally believe that the market should dictate the cost, in this case the market is wrong. That all being said, for the time being I will likely hold off on ordering this tool until the New Year. On President’s Day weekend Lie Nielsen is having a hand tool event in Philadelphia, and I may wait until then before I make my final decision. That may mean holding off on getting my hickory logs into usable boards, but I wasn’t planning on doing anything with them until at least the end of January to begin with (I’m planning on making a handful of mallets with one log, among other things) The strange part in all of this is just how far off my estimates were. I’m generally pretty good when it comes to knowing what a tool should and shouldn’t cost. When it came to the scrub plane I was off by a lot, and most of the tools I found were at least double the cost I thought they should have been. I don’t know what changed the market, and I don’t really care. I just know that in this case a vintage tool was not the way to go, and sadly, I’ve found that this is more and more becoming a common occurrence. Can a woodworker have too many tools? December 6, 2016 9:43 am / 12 Comments on Can a woodworker have too many tools? The spring and summer of 2016 has led me to more vintage woodworking tools (and tools in general) than the entire past 6 years combined. Last January I made the vow to not purchase any new woodworking tools. I sort of broke that vow when I purchased a bench grinder specifically for sharpening woodworking tools, but otherwise, I haven’t made a single purchase. That being said, I’ve shared on this very blog some of the many vintage tools I’ve come across during the past months. The good news: I paid little or literally nothing for all of them; the bad news: I have a lot of old tools laying around that need a lot of work. So this all leads to the question: Can a woodworker have too many tools? As of today, the mindset among the most influential woodworkers seems to be that too many tools is a bad thing. The arguments are compelling: they take up space, they take up time, they decrease the chance that a woodworker will develop proficiency in using a core set of tools, and maybe most importantly, they can be expensive (in particular if you are purchasing nothing but new tools). 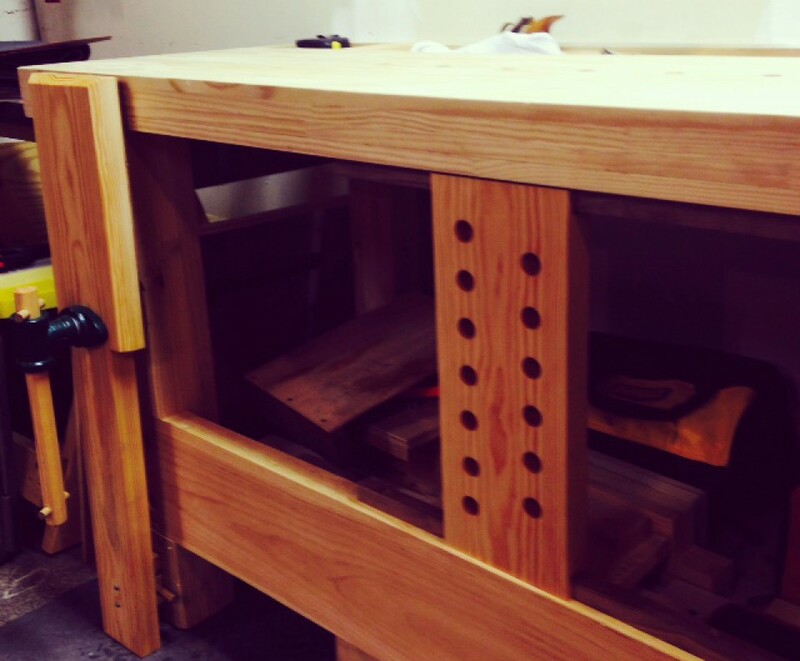 Too many tools can also keep a woodworker from actually making furniture. Care for both new and vintage tools can be very time consuming (this includes power tools). As of today, I have enough vintage tools in need of restoration to take me well into next spring. If I spent every Sunday restoring one of my vintage tools (that needs restoration) I estimate that the my next piece of finished furniture wouldn’t happen until sometime at the end of April, 2017. The whole idea of woodworking is actually working wood, isn’t it? Tools can be fun, for sure, but tools are just a means to an end, right? The furniture, the end result of our toil, is why we woodwork. So that still poses the question: Can a woodworker have too many tools? After careful consideration, my answer is: F**K NO.